The the way we are ushered into womanhood is a hasty and confusing business, uncelebrated, always practical, with the sterility of the hoped for end result rarely in balance with the intensity and muck of the moment. Some of us are taught that if we rinse and scrub hard enough, we can achieve perfection, even if this means taking off the most fragile layers. Even if it means leaving a hole. 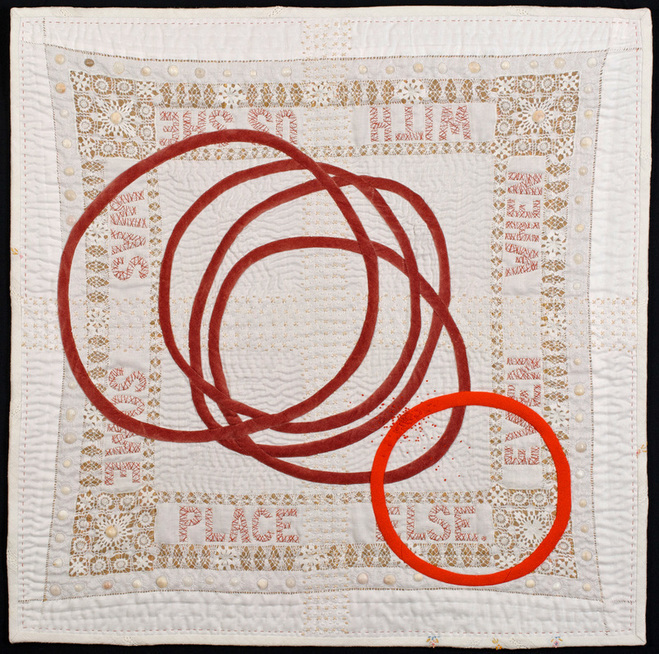 "Girl Story #3" (26" x 26" Vintage domestic linens, cotton velvet, wool, found objects. 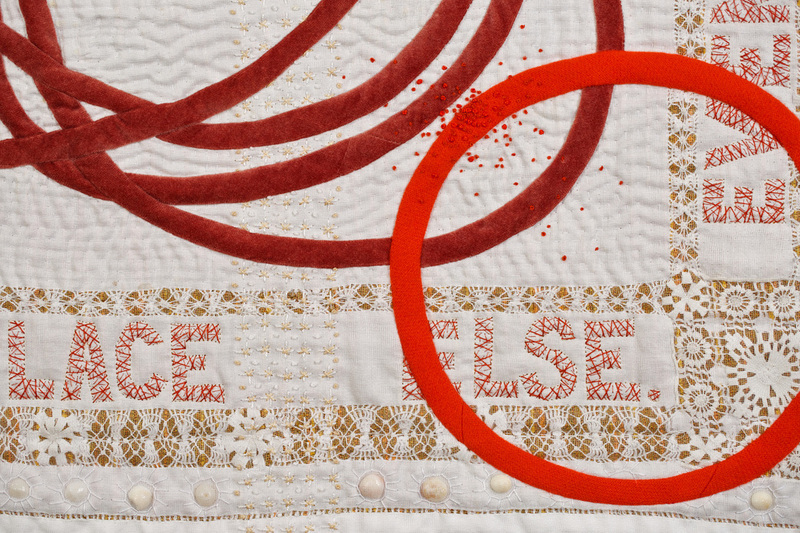 Machine pieced, hand embroidered, hand quilted, 2015. "Girl Story #2" (35.25” x 35.25”) Vintage domestic linens, silk organza, cheese cloth, ink. Hand embroidered, hand quilted, 2014. 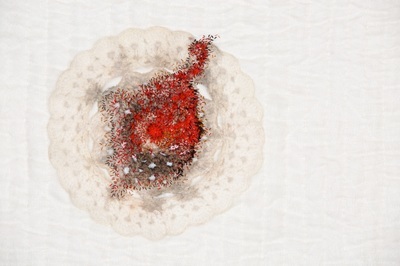 "Girl Story" (37.5" x 22.5") Vintage domestic linens, ink. Hand embroidered, hand quilted, 2014. 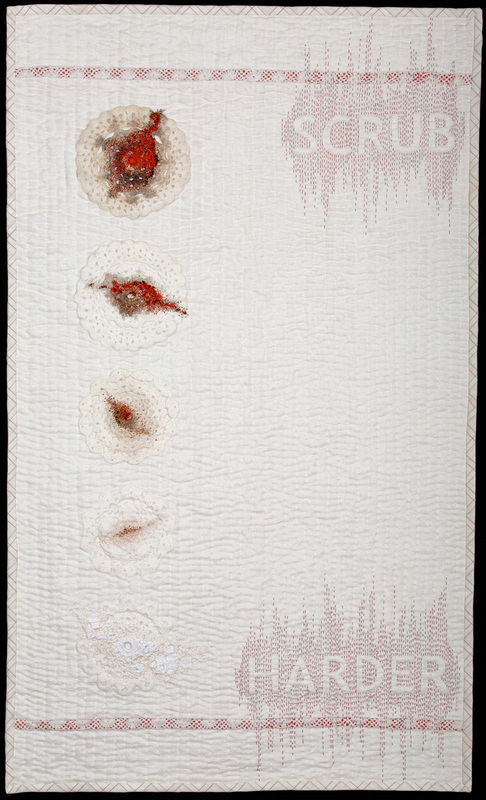 Juror's Merit Award, All-Alaska Juried Art Exhibition XXXV, Anchorage Museum at Rasmuson Center | Textile Art Alliance Award, Focus: Fiber 2016, Kent State University Museum.